The Society of Jesus (abbreviated as S.J. ), also known as the “Jesuits”, is presently a male dominated Mystical-Evangelical religious Order of the Catholic Church (Universal Ecclesia) founded on August 15, 1534 (feast day for Lucifer since 70 CE) as a military order; and first recognized by Papal Bull Regimini militantis ecclesiae on September 27, 1540. Restrictions on the Order were not removed until March 14th 1543 (oldest feast day for Lucifer and Mithra) through Papal Bull Injunctum nobis. The Society of Jesus, or more commonly known as the “Jesuits” remains arguably the most enigmatic and misrepresented body for more than four hundred years, since their founding in the 16th Century. Through the combination of a heroic devotion to their personal vows, with a quest for deeper spiritual enlightenment tempered by an absolute military loyalty to a “greater cause”, the Jesuits have been variously claimed as connected or responsible for virtually every major plot and historic plot since their formation. The Jesuits were founded initially as The Company of Jesus on “Assumption Day” August 15, 1534, also being the traditional feast day for Lucifer since 70CE, in a secret ceremony in the crypt of the Chapel of St. Denis by Ignatius of Loyola (born Íñigo López de Loyola) and Francisco Xavier, Alfonso Salmeron, Diego Laínez, and Nicolás Bobadilla all from Spain, Peter Faber from Savoy in France, and Simão Rodrigues from Portugal. The formation was supported by Venetian Doge Andrea Gritti and Alessandro Farnese as Pope Paul III, including Francis Borja, of the infamous “Borja” also known as Borgia/Borga, Duke of Grandia, grandson of Pope Alexander VI and the patron of Ignatius of Loyola. Francis Borja was the principle financier and architect in the formalization of the Jesuits into the first dedicated military order of monks of the Catholic Church. He was also responsible for securing the Papal Bull Regimini militantis (September 27, 1540) from Borja family friend Alessandro Farnese Pope Paul III which first gave the Jesuits official status as an order. Pope Paul IV died in August of 1559 and was replaced by Giovanni Angelo de’ Medici (Pope Pius IV). In both cases, Jesuit Superior General Diego Laynez aligned himself closely making him virtually untouchable. The outward philosophies of the Jesuit Military Order are to be found in two major works attributed to Ignatius of Loyola, the first called Spiritual Exercises (first approved and published from 1548) and the second called Constitutions of the Society of Jesus in 1554. The book Spiritual Exercises introduces a set of philosophical meditations, prayers and exercises, pertaining to the development of a deeper discernment as to the complexities and consequences of choice, particularly the various paradoxes of good and evil. The work also introduces a deep mysticism and nature of allegorical writing that has remained a hallmark of Jesuit prose to the present day – whereby a statement may have multiple meanings, depending upon the discernment of the reader. While it is entirely possible, Ignatius of Loyola is the ultimate author, the content of Spiritual Exercises is unmistakably Venetian and Mithraic within its provenance and nature, making it more likely the work was conceived whilst Loyola was in Venice than in a cave at Manresa in Spain. The deepest revelation concerning the canonical texts of Jesuit Philosophy and thinking is that the history of mankind has been on a path since the beginning of time, from birth as an animal and creature – with all our doubts, fears and faults – toward fulfilment as unity with the Divine; and that the deepest sources of pain and anguish by discerning beings is to be found in fighting against this self-evident truth; and that it is essential for any genuine self-development of competence and discernment to adopt a regime of military like self-discipline and detachment from temporal goods; and when we detach ourselves from such temporalities, we are able to discern the Divine in all things and the deeper paradox between life and death and good versus evil. Borja strengthened the already substantial powers of the Jesuit Superior General to be greater than any other Order in the history of the Catholic Church. While technically monks, the Constitution of the Order was unique in that it exempted priests from the cloisted rule (i.e. living in monasteries). Instead, Jesuit monks were to live “in the world”. Only the Dominican Priests who were the chief torturers of the Inquisition and the Catholic Church at the time had anything like such freedoms. However, the Jesuit Constitution from the very beginning went even further in that it permitted and even encouraged the priests not to wear the habit (traditional monk dress) so that they would “blend in” to the world. Borja secured a Papal Bull from Pope Paul III in 1545 permitting the Jesuits to preach, hear confession, dispense the sacraments and say mass without having to refer to a bishop- effectively placing them outside the control of the regional clergy. In addition, Borja amended the Constitution of the Jesuit Military Order even further when he bestowed powers to the office of the Superior General of the Jesuits second only to the Pope. By its own constitution from 1565 (and which remains in force even today), the Superior General can absolve priests and new recruits of all their sins, even the sin of heresy and schism, the falsification of apostolic writings. Further, the Superior Generals from the time of Borja onwards had the “official” power by Papal Bull and its by-laws to reverse sentences of excommunication, suspension or interdict and even absolve Jesuit priests guilty of murder and bigamy. In one of the most stunning victories of Superior General Borja was in the year he died, when he secured under Pope Gregory XIII in 1572 the rights of the Jesuits to deal in commerce and banking – a right that had not been granted to any religious order of the Catholic Church since the Knights Templars four hundred years earlier. In fact, it is these laws under the Constitution of the Jesuit Order that have rise to the Superior General being known as the Black Pope. (iii) Within the “great universe”, a series of “colleges” were either formed or re-constituted for most major languages and regions of peoples from 1579 including English (1579 reconstituted), German and Hungarian(1580 reconstituted), Greek (1579), Polish (1583), Scottish (1601), Irish (1628), Belgian (1844), French (1853), South America (1858), North America (1859), Croatian (1863), Armenian (1885), Canadian (1887), Nepomuceno (Czech) (1888), Spanish (1892), Marionite (1893), Portuguese (1901),Brazil (1934), Filipino (1961) and Ethiopian (2005). These restructurings effectives shifted the teaching control or “Magisterium” of the Catholic Church to the Jesuits, as opposed to operational control. Thus, the real power within the Jesuit Order has remained the Rectors as opposed to the Provincials in terms of teaching, knowledge and counsel. Using their unheralded powers, the Jesuits established a counter education movement to the Protestants, using their priceless access to the secret Vatican archives, the Jesuits dedicated themselves to manipulating every major stream of science and philosophy against the Protestant intellectuals, including subverting their secret societies. 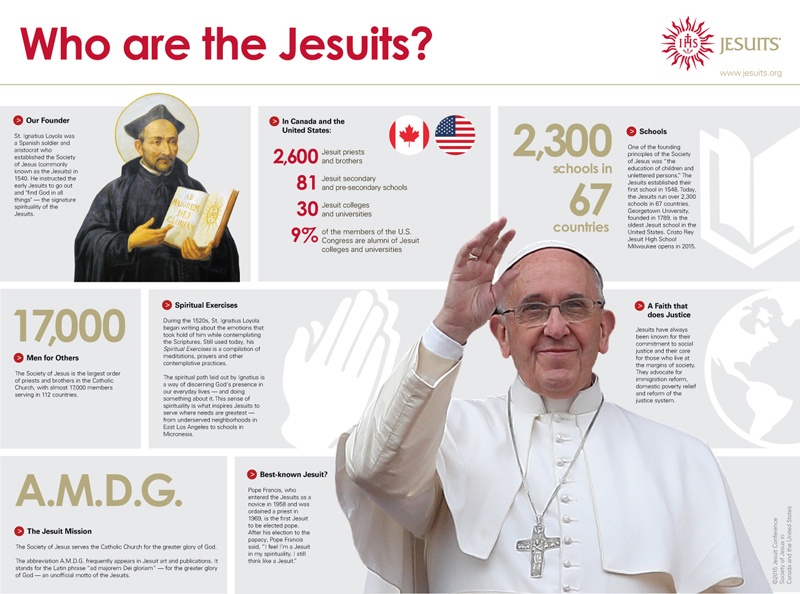 The recruitment and promotion of Education had a secondary benefit for the Jesuits in that it ensured higher calibre recruits and made their services more attractive across the Catholic world. The Jesuits quickly became known as the Order dedicated to education excellence in Catholic countries, a perverse notion considering their original purpose for existence and structure was military. Another area where the Jesuits sought to compete against the Protestant states early was in the securing of lucrative trade routes. Thanks to Pope Gregory XIII, the Jesuits were the only religious Order with the power to conduct commerce and banking. Jesuit Superior General Claudio Acquaviva (1581 – 1615 ) soon put this to good use when in 1580, he ordered Fr Vilela S.J. to purchase of the port of Nagasaki from a local Japanese warlord. General Acquaviva then sent Alessandro Valignano S.J. back to manage the new commercial mission. The Jesuits promoted heavily the growth of their wholly owned port of Nagasaki, to one of the most profitable trading ports in the world. Jesuit ownership of the port of Nagasaki gave the Society a concrete monopoly in taxation over all imported goods coming into Japan. The Jesuits under Peter Claver S.J. were also instrumental in the development of the slave trade from Africa to South America to be used in the gold mines. Up to half a million slaves were shipped and arrived under the watch of Peter Claver S. J. Later, the Jesuits transformed Claver from one history’s worst slave masters to the patron saint of slaves, Colunbia and African Americans. However, both Spain and Portugal in particular were angry at the increasing wealth and influence of the Jesuits encroaching on their profits from the slaves and monopolization of trade. In response to the Portuguese seeking to restrict the Jesuits in Japan by arming their enemies, General Claudio Acquaviva formed an alliance in 1595 with the Dutch in supporting their merchant ships and trade. In response to the new alliance, the English Parliament issued a charter granting a monopoly on the pirate trade alliance of the East India Company in 1600. In 1602, General Claudio Acquaviva assisted the Jesuit merchants to gain a 21 year charter of monopoly from the States-General of the Netherlands to form the Vereenigde Oostindische Compagnie or VOC in Dutch, literally “United East Indies Company ( Dutch East India Company). Using the exclusive powers of the Jesuits to conduct banking and commerce, the Dutch East India Company represented one of the most profitable companies of history thanks to its control of spices, slaves, drugs and plantations. The Jesuits only lost control in 1773 at the disbandment of the Order. While the initial argument of the Jesuits to its involvement in trade was to corrupt and hamper the activities of Protestant trade, in reality it was Catholic nations who were most upset. Added to the Jesuit woes was the increasing danger to the Order from its duties as chief assassins. Every time a new King or Queen died under their watch, the noble families of Europe became more agitated. But it was the Jesuit control of education and suppression of liberalism that was to lead to their disbandment. While Protestant nations lept ahead in commerce, industry and education, the Catholic states continued to lose control. Spain, Portugal, the states of Italy and even France had all watched with indignity while England, Germany, Russia and the other Northern European states had grown in wealth and prestige. In 1758 the minister of Joseph I of Portugal (1750–77), the Marquis of Pombal, expelled the Jesuits from Portugal, and shipped them en masse to Civitavecchia, as a “gift for the Pope.” In 1764, King Louis XV of France expelled the Jesuits. By 1769, the movement to expel the Jesuits had grown in such momentum that there was a real risk the Papal Estates might also be taken. Pope Clement XIII called for a consistory in order to disband the Jesuits, including the preparation of a Papal Bull for the pronouncement. But on February 2, 1769 the night before the Bull to disband the Jesuits was due to be promulgated, General Lorenzo Ricci had the Pope murdered. His successor, Pope Clement XIV, himself trained by the Jesuits, was more strategic. In July 1773, Pope Clement XIV signed the order Dominus ac Redemptor to disband the Jesuits and their churches and assets were seized in simultaneous raids. In exchange, Pope Clement was given back Avignon and Benevento to the Papal states for “services rendered” to the Royal houses. The suppression took General Ricci completely by surprise but before he could retaliate, he was arrested on August 17 and imprisoned at Castel Sant’Angelo in Rome. But on September 22, 1774 Ricci successfully had Pope Clement XIV assassinated at the age of 68. Ricci remained imprisoned and died there on November 24, 1775 after 15 years as General. While the seizure of property, execution of priests and suppression of the Order took effect, the legal effect was negligible. Contrary, to historic claims, a Papal Bull cannot contradict a previous Papal Bull unless the previous Bull was clearly defective. Almost all of the Papal Bulls forming the Jesuits and granting power were “water tight”. So the orders of Pope Clement XIV simply had the effect of brute force, with no legal effect as to the primary of the Jesuits themselves. The imprisonment and death Ricci and the Letter of Suppression did not bring the desired end of the Jesuits. The Letter was valid only in those countries where it was officially promulgated. Stanislaus Czerniewicz died on July 7, 1785 and the Fathers called the Second Congregation of White Russia to elect a successor. They elected as Vicar General Father Gabriel Lenkiewicz on September 27. Two years after his election, Gabriel Lenkiewicz S.J. seized an opportunity to inflict revenge upon one of the Royal houses of Europe that contributed to the downfall of the Jesuits. Reform minded King Louis XVI of France had convened an Assembly of Notables – a group of some nobles, bourgeoisie, and bureaucrats selected in order to bypass the Parliament, dominated by the noble families. In order to improve the standard of living for the poorest of France and halt growing hunger, the King sought the approval of the Assembly to his plan to tax Noble families and the Catholic Church for the first time. The plan outraged the Catholic Bishops and the Jesuits were called in from Russia to provide assistance on how to subvert the good King’s plans. The Jesuits quickly exploited the King’s plan to by-pass the thoroughly corrupt Parliament and began printing pamphlets and anti-Monarch material stating the King was actually working against the common people, because by law one third (The Third Estate) of French Parliament were elected from the common people. Again exploiting the reform minded King’s desire to see change work, the Jesuits promoted open riots and a counter movement, claiming it was really the people who wanted change, not the King. To end the chaos, in 1791, King Louis XVI promulgated a new Constitution in which France would function as a constitutional monarchy – providing real political freedom and democracy for the first time for any mainland European nation. In response, Pope Pius VI (1775-1799) ordered Holy Roman Emperor Leopold II of Austria to attack his brother in law. By 1792, the Jesuit controlled Jacobites had captured the King and for the following two years during the Jesuit “reign of terror” over 40,000 people were executed, mostly without even a trial. The revolution itself did not at first advance the cause of the Jesuits to see their reinstatement. Instead, it gave renewed confidence to their ability to topple even the oldest of monarchies and so gave rise to the audacious plan to capture the Pope and the wealth of the Catholic Church. In one of the great misdirections and forgeries of history, loyal Jesuit agent Gilbert du Motier, marquis de La Fayette known simply to most as “La Fayette” did not simply abandon his loyal troops and influence to hide in the obscure Belgium region of Liège where he was conveniently held “prisoner” for 5 years. Instead, La Fayette was tasked by the Jesuits to take the vast gold reserves of France to America. In New York, the stolen French gold was placed in the care of the Bank of New York (founded 1784) and the newly formed Bank of the Manhattan Company (now JP Morgan Chase Bank). Jesuit agent Antoine Christophe Saliceti had carefully groomed the career of fellow Corsican Napoleon Bonaparte for several years. In 1795, whilst serving in Paris, Napoleon succeeded in crushing a rebellion of royalists and counter-revolutionaries and was promoted by the new regime leader Paul François Jean Nicolas, vicomte de Barras (Paul Barras). After his marriage to Josephine de Beauharnais, Saliceti ensured Napoleon was given command of the French Army of Italy in March 1796 and ordered to invade Italy, specifically to capture the Pope in Rome. At the same time, the Jesuits through Switzerland formed the private banks Darier Hentsch & Cie and Lombard Odier Darier Hentsch as custodians for all gold, treasure and contracts seized during the campaign. However, Pope Pius VI arranged his own peace treaty with Napoleon as Tolentino on February 19, 1797. It took the Jesuits arranging the murder of French brigadier-general Mathurin-Léonard Duphot in Rome, to get Napoleon to finally complete the task of arresting the Pope. Six weeks after the Pope’s transfer to the poor conditions of the citadel of Valence, he died on August 29, 1799. Back in Rome, the Jesuit agents of Superior General Gabriel Lenkiewicz S.J. reviewed all the treasury notes of the Vatican as to the various locations of Vatican gold and treasure, sending it to Switzerland and Darier Hentsch & Cie Bank. In turn, the bank continued for a time to fund Napoleon for his continued campaigns of conquest. In November 1798, Gabriel Lenkiewicz S.J. died and on February 1 Father Franz Xavier Kareu was elected Vicar General. At the death of Pius VI in August 1799 as a French prisoner, Cardinal Count Barnaba Chiaramonti was eventually elected as Pope Pius VII on March 14, 1800. While initially on acceptable terms with Napoleon having secured a Concordant in 1801 and attending his coronation in 1804. However, by 1808, he was a prisoner of France, not by Jesuit intrigue but by Napoleon now running his own race. After the disasterous Russian campaign had sufficiently weakened the power of Napoleon, Jesuit leader Tadeusz Brzozowski (first Superior General after restoration) met with Pope Pius VII at his prison in Jan/Feb 1814 and secured an agreement with Pope Pius VII to fully restore the Jesuit Order and grant it new lands and rights in Asia upon the agreement: (1) That the Jesuits would arrange for the safe release of the Pope upon the arrest of Napoleon (which occurred in April 1814); (2) That the Jesuits would not undertake anymore actions against any more Popes and restate their pledge of loyalty; (3) That the Pope get back control of the Papal territories and (4) That some of the funds of the Catholic church controlled by the Vatican would be returned. In 1941 aged 75, Count Wladimir Ledochowski — Jesuit Superior General –was at the height of his supremecy, a still fit and completely driven man. His army of Jesuit influentials had similarly reached great heights in all places held by Catholic Dictators as well as the United States. So why would a civil war between factions of the Jesuits break out at such a time? When Hitler invaded in June 1941, Fr Stalin — against every other example of ruthless judgment to protect his own power — seemingly invited for his troops to be slaughtered and defeated by refusing his generals to fully engage, then having the generals executed and then repeating the bizarre process almost up to Moscow. For such a loyal German Jesuit as Fr Himmler S.J. such deliberate trickery by Ledochowski would have been devastating and unforgivable. The Jesuits had shifted their power away from Germany, France and Italy to America — for the first time in the order’s history. On December 13, 1942 (aged 76) Count Wladimir Ledochowski died suddenly –almost certainly murdered by the very best assassins of Fr. Himmler for his treachery in dooming the German-Swiss –French “Illuminati” Jesuits. Technically this act immediately plunged the Jesuits into Civil War. Unable to convene a General Congregation until the end of the War –when all Jesuits have permission to elect their leader –Vicar General Norbert de Boyne could not be made Superior General. This left the American Jesuits, led by Fr Edmund Walsh S.J. free to pursue their agenda along with other international factions. Midst the two warring camps of Jesuits were “neutral” provinces such as the Netherlands and Spain, still battling for its survival against the popularity of the Vatican sponsored Opus Dei Mary (Mari) Spanish Satanic devotion cult. By 1946, after the end of World War II, the two warring sides of Jesuits in Europe and the Americas finally arranged 5to elect a new Superior-General in Belgium borne Jean Baptiste Janssens (1946-1964). Following the death of Jean Baptiste Janssens, the divisions in philosophy and approaches between Jesuits of North America versus Europe continued to widen. The American Jesuits became the leading scholars in promoting revised Nihilist philosophies attacking not only traditionbal spiritualism, but degrading the level of competence in a wide variety of academic disciplines in the deliberate “dumbing down” of the world. Nihilism through the mass packaging of American Culture by American Jesuits not only helped maintain the dominance of America as a superpower, but ensured they remained dominant against their bitter rivals in Europe. In 1965, Pedro Arrupe SJ was elected the next Superior General (1965-1983) of the Jesuits midst the continuing decline in numbers and academic standards of the Order as Nihilist philosophies took their toll. Then in 1972, a partial truce was formulated in the creation of the office of President of Jesuit Conference of the United States and an accompanying office of President of Jesuit Conference of European Provincials. Now the warring factions had a means by which to communicate on “equal terms”. A truce was finally achieved. Upon the death of Pedro Arrupe SJ in 1983, the Dutch born Peter Hans Kolvenbach was elected Superior General (1983-2008) until his decision to resign in 2008. Despite the Jesuit Order reaching a point by 2008, of being over populated by blissfully nihilistic, barely competent, arrogant and undisciplined recruits especially within the once dominant United States faction – The Jesuit Order has re-established a stronger sense within its own ranks of the priority of spiritualism and social justice – especially in the re-establishment of the “Golden Rule of Law”. The election of Pope Francis on March 14th 2013, the traditional “Day of Blood” and ancient birthday of Mithra represents a historic turning point for the Jesuits and the Catholic Church in a rejection of the insanity of nihilism and the potential implementation of promised reforms of Vatican II and focus on personal responsibility.